As I continue to construct my analysis, I have decided to switch to a new artifact. I will be analyzing the brand, Dove, and how they promote beauty and confidence in women through their products. You may find my artifact below. Dove has brought serious attention to the issues that women are dealt with on a daily basis, which is how they perceive themselves. According to my artifact, women struggle with seeing themselves beyond their imperfections. Throughout the ad, each woman featured is challenged to describe herself, and what’s apparent is how much they focus on what they do not like about their appearance. Through this video, Dove conveys a message that woman are constantly putting themselves down for how they look, because they would rather look a certain way, and thus, their inner and outer beauty needs to be appreciated. Dove is brining up a vulnerable, yet important social issue on how women’s self-esteem needs to rapidly change, by showing that all women deserve to feel beautiful. Considering that this artifact focuses on deconstructing the norms of how women are perceived, I believe the method I would need to analyze is feminist criticism. I would choose this method because the ad’s central focus is to get rid of how women view themselves poorly. Thus, a feminist perspective would bring attention to this social issue, and try to act on this problem, by critiquing how members of society among women have created unrealistic images of how women wish to look. Dove is targeting women among modern day society that struggle with similar issues to the women in this ad. Because the ad features women of all ages, it appears that this artifact is aiming towards all types of age groups among women, and significantly, this brings a sense of inclusion to the women population that women ranging from younger to older experience the same struggles in the ways they view themselves. The implications of this company’s rhetoric is that Dove wants to bring women together, and lift each other up in order to tear down negative self-esteem that is experienced in an individual woman’s daily life. I have gathered an assumption that Dove is trying to sell their products with a story and a purpose. I am a frequent consumer of Dove beauty products, however, their message of delivering positive experiences about how women feel about themselves makes me value my products even more. I assume that Dove cares deeply on the social issue addressed about women’s lack of positive self-esteem, and has taken matters into their own hands. The members of this organization may have previously experienced lower self-confidence, or body image struggles, and put that into products that can make women feel confident. Another assumption may be that the members of this organization feel deeply about empowering women, and utilize their passions throughout their time spent in this organization. 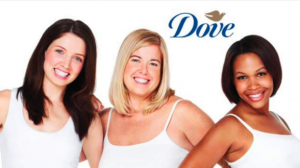 Society in general has clearly created false ideas of how women should look, and Dove is striving to end those generalizations for the well-being of struggling women. The visual rhetoric in this artifact suggests how women all come from different colors, shapes, and sizes, and are all made differently. This ad highlights the vulnerability shown in each women when they talk about what they’d like to change about themselves. The audience is able to see how women react to the images that are drawn of themselves by the artist in the video. Drawings of the women are shown, and the audience can visualize how hard women are on themselves for the appearances, when the drawings turn out to look nothing like them in real life. I think this can be answered rather broadly, however, when it comes to what interests represented by the organizations message, I think they primarily focus on women empowerment. Dove makes a powerful message that they want all women to change negative perspectives of themselves. Therefore, I can conclude that this organization feels passionately about making women feel they way they deserve, by giving them the freedom to open up about their insecurities, which, enables them to get past those insecurities. When women are encouraging other women, less harsh judgement is made about each other, and Dove is striving to end that through their ad. I strongly hope that anyone (even men if applicable), that finds this analysis relatable, or applicable to their lives can overcome their failure to view themselves for who they truly are. I believe that there is something about everyone in society that makes them unique, and when societal pressures to look a certain way takes over, most often, we tend to put ourselves down for not looking like a model on a magazine, for example. I believe my analysis can bring positive reinforcement on encouraging women to embrace their true selves, and that my potential audience is able to do so as well.